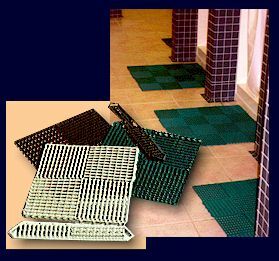 Envirotiles -- The ultimate interlocking mat for all your wet area needs: locker room, laundry rooms, pool areas, etc. Envirotiles are available in charcoal, teal, white and blue. Centaur Envirotiles are the ultimate interlocking non-slip industrial surface tile. Their totally new and unique design allows user to assemble complete, continuous mats to prevent tripping. Their exclusive wrap-around provides integrated corner mats for smooth access for both pedestrian and rolling equipment. These modular tiles are 12 x 12 (30.5 cm x 30.5 cm) and can be assembled to exact user specs. Tiles contain 394 holes per square foot for drainage. The ultimate interlocking mat for all your wet area needs: locker room, laundry rooms, pool areas, etc. The Envirotiles hug the floor and give maximum gripping action on both sides of the mat. They are specially designed to give continuous user comfort. They are impervious to most chemicals, oils and grease, and are mold and mildew proof.